One of the principal objections to flats is that the smell of the cooking permeates the whole of the house, but this is here well provided against by the construction of large halls between the sitting-rooms and the kitchens. It will be seen that it is very difficult to provide pleasant recesses in the rooms such as ingle nooks, but at least it has been possible to arrange the dining-room fireplace in the corner, and the hall fireplace also, while the rooms are large enough for the avoidance of draught. The plan is not an entirely modern one, and under the present London Building Act the service lift would have to be replaced by a subsidiary staircase for use in case of fire. Since it was designed, too, the idea of planning flats on narrow frontages such as are suitable for houses has been to a large extent abandoned, for it almost necessarily leads, as in this case, to the use of well-like areas, providing but indifferent light and ventilation to the rooms whose windows open on to them. Fig. 18 illustrates a row of shops designed by Mr. J. 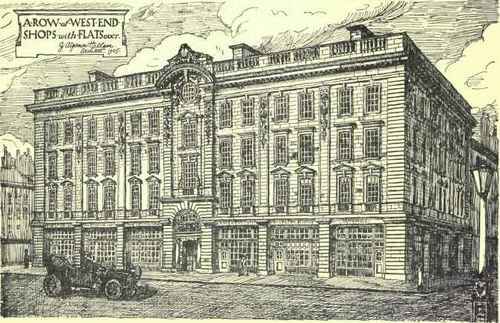 A. Hallam for the west end of London, with flats above them. This is an economy of space which is now frequently adopted, the shops being here shown as mere open spaces on the ground floor with stairs down to basement storerooms, and have to be locked up when left of a night. Each of those shown has a small office attached to it at the back, and those near the centre have a long narrow storeroom on the ground floor behind the general staircase, which leads up to the flats. This is in the centre of the block at the front, and the lift passes up a staircase well, as is usual, though the architectural effect is forcibly marred thereby. 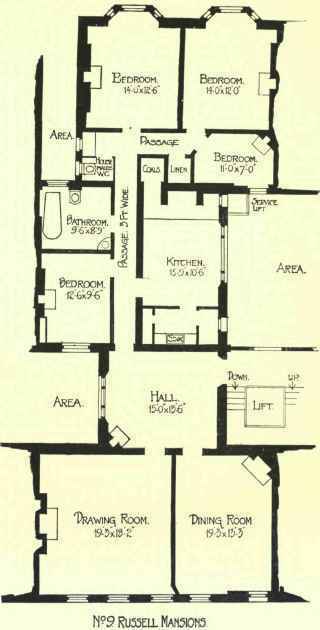 The plan of the upper floor is somewhat interesting, though considerable use of girders has been made to carry the internal walls. It covers a considerable amount of space, but there are no enclosed areas, and all the principal rooms have windows upon a street frontage. There is a long passage to serve the various rooms, but it is well lighted by a bow window, and the flat is well departmented, a kitchen, scullery, and larder, with a coal bunk opening out of the kitchen, being quite self-contained, there being only one communicating door, which is almost opposite that of the dining-room, disconnection being obtained by the introduction of a small servery. The servants' w.c. is reached by way of a small open balcony, large enough for the movable dust receptacle. All the w.c.'s are at the back, while a gentlemen's lavatory is provided, opening out of the hall, much as is usual in large private houses. The dining-room and drawing-room open out of the main corridor; but this, the reception part of the house, is detached from that part which is used for bedrooms by swing doors leading into another corridor, itself well lighted. There are four bedrooms, and also a large dressing-room which could be used as an additional bedroom if required, together with a linen cupboard and bathroom, so that the total accommodation is not different from that found in many a detached house. All the rooms and corridors are well lighted, and although naturally it has been impossible to consider the question of either prospect or of aspect, save so far as to place the kitchen in the rear and the principal sitting-rooms in the front, a certain amount of architectural treatment has been secured internally, both in the corridor and in the rectangular and symmetrically planned rooms. Figs. 17 and i8a may thus be taken as illustrating two distinct types of London flats, of which the variety is necessarily great, owing to the particular requirements of particular sites. 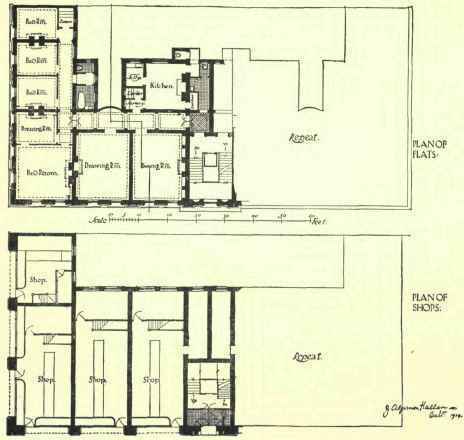 There is accordingly more scope for ingenuity in planning than there is in the detached or semi-detached house, especially if small areas and narrow unventilated spaces are to be avoided, and economy of space obtained at the same time as considerable luxury of living, and architectural treatment of stairs and approaches as well as of the principal rooms of each tenement. With these may very well be contrasted a typical New York apartmental hotel, as it is called, such as is illustrated in Fig. 19, this being the plan of one of the floors of a well known "Sky-scraper." It will be seen that the public hall and staircase are in the middle of the site, there being two elevators or lifts, one for passengers and one for freight, passing up from bottom to top of the building. There is also a small service staircase close to the freight elevator, having a sink in a dark cupboard on each landing. The drawing needs a little careful consideration in order to observe how it is meant to work the various flats; but this is a case in which each residence is not self-contained, it being intended that the various persons who occupy suites of rooms shall rent them for parlour and bedroom use, while they take their meals in the general dining-rooms of the hotel. There are thus no private servants, all service being provided by the management, and consequently there are no separate kitchens to the several flats, which are capable of being let off in suites of two, three or more rooms as desired, there being communicating doors between the various rooms, which have to be locked in the event of the adjoining apartments being let to different persons. A large number of bathrooms are consequently provided, it being apparently supposed that as a general rule a suite shall consist of a parlour and either one or two bedrooms at the most, together with a dark and unventilated cupboard, sometimes opening from the private hall, and frequently from the bedroom, where in America they take the place of the English wardrobe. The w.c. is in every case shown in the bathroom, an arrangement which has nothing save economy of space to recommend it. Fireplaces are not shown in all the rooms, nor would they be necessary, for the heating would as a rule be accomplished by means of hot water or steam radiators, the circular flue from the heating apparatus being shown in one corner. The public hall is well lighted, and so are the rooms generally, but the little private hall to each separate flat would be dark, and in some cases tortuous. Darkness, however, would probably be little objected to where electric light is plentiful, but unfortunately it is generally combined with insufficient ventilation, and the English well-lighted hall and passages would be preferable.